The extremely thin and delicate tympanic membrane (TM) is the first component of the middle ear conductive system. The TM is easily traumatized, and diseases of the TM deprive patients of their ability to work and to enjoy life. Myringitis, or inflammation of the TM, may be accompanied by hearing impairment and a sensation of congestion and earache. After 3 weeks, acute myringitis becomes subacute and, within 3 months, chronic. The TM lies across the end of the external auditory canal (EAC) and looks like a flattened cone with its apex pointed inward as seen in the image below. The diameter of the TM is about 8-10 millimeters. Its outer surface is slightly concave. The edge of the membrane is thickened and attached to a groove in an incomplete ring of bone, the tympanic annulus, which almost encircles it and holds the membrane in place as seen in the image below. Normal tympanic membrane. 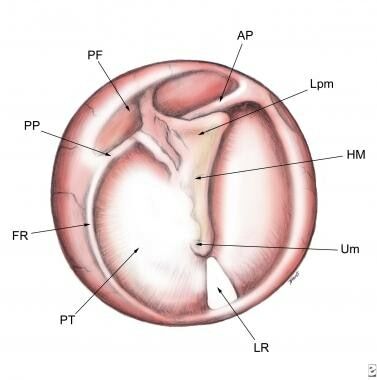 Pars tensa (PT), pars flaccida (PF), light reflex (LR), fibrous ring (FR), umbo (Um), handle of malleus (HM), lateral process of malleus (Lpm), anterior plica (AP), posterior plica (PP). In newborns, the angle of incline of the TM is more than 30° relative to the horizontal plane. In addition, the TM in newborns is thicker than in adults; consequently, in the newborn, examining the TM is sometimes difficult. The uppermost small area of the membrane, where the ring is open, is under no tension; this part is known as the pars flaccida. The majority of the membrane is tightly stretched; this is called the pars tensa. The loose part of the TM, or the pars flaccida, borders on the pars tensa from above and is considerably smaller, about one-eighth the size of the pars tensa. See the image below. Mirror display of a tympanic membrane surface on the polymeric masc from external acoustical canal of healthy man. Masc of tympanic membrane surface (MtmS). The physiologic function of the TM involves conduction of sound to the middle ear through a system of small bones, the ossicles. The surface of the TM is approximately 25 times larger than that of the stapes footplate, with the resulting amplification of sound to 45 decibels, or 27 times ambient volume levels. At the same time, the TM forms a safe shield with the round window of the labyrinth against direct sound waves. This window is necessary for movement of the liquid in the cochlea, providing for transmission of the sound to the acoustic receptors in the organ of Corti. In addition, the TM protects the gentle mucosa of the middle ear from the external environment. Seek emergency department or primary care when a patient presents with acute myringitis, suspected otitis media, external otitis, or foreign bodies in the ear. Analgesics, anti-inflammatory medications, antipruritics, and antihistamines may be prescribed. In case of suppurative complications, perforated TM, or suspicion of mastoiditis, consultation with an otolaryngology (ENT) specialist is imperative. A useful method of myringoplasty (surgical closure of a TM perforation), described by Heermann, uses a cartilaginous framework. The TM is supported by the cartilaginous palisade without affecting mobility. Regarding diseases of the TM, discussion of pathophysiology includes the concrete causes, mechanisms, and common regularities of source, development, and termination of myringitis. Myringitises can develop as self-maintained primary disease of the TM (primary myringitis) or as an effect of an inflammatory process of adjacent tissues of the external or middle ear (secondary myringitis). The etiology and pathogenesis of primary myringitis and secondary myringitis are significantly different, and they require different treatments. Therefore, they should be considered separately. Acute myringitis can occur because of direct trauma to the TM through penetration by a foreign body. Primary myringitis may also be caused by unsuccessful removal of a foreign body, such as a live insect, or it may occur during self-cleaning of the ear. An explosion, a change in the pressure in an airplane cabin, a blow to the ear with the palm, or even a kiss in the ear can cause trauma to the TM. Acute bullous myringitis can be the consequence of a bacterial infection such as Streptococcus pneumoniae or a viral infection such as influenza, herpes zoster, and others. Fungal myringitis can be the consequence of a fungal infection of the TM's epidermis. Eczematous myringitis can occur in cases of dermal eczema of the TM's epidermis. Myringitis granulosa occurs when the TM is covered with granulation tissue. The causes of this destruction of the TM's epidermis are rarely clear, except when a similar case is demonstrated during a myringoplasty, when the epidermis perishes, or when the mucosa, expanding from a tympanic membrane perforation, erases an epidermis. The TM is involved in the initial stage of acute otitis media (AOM), the stage when negative pressure is formed in the middle ear space. 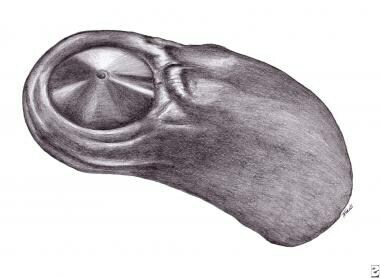 During this time, the handle of the malleus, the lateral process of the malleus, and the TM bulge outward. The pars flaccida is also noticeably affected. With the appearance of fluid in the middle ear, these phenomena disappear from the surface of the TM, so observing the fluid is possible. The inflammatory process of an upper respiratory tract infection affects the TM in the form of myringitis. The TM becomes red and thickened, and the light reflex disappears. Increased inflammation in the middle ear results in bulging of the TM with possible perforation. This is accompanied by intense earache and by typical clinical manifestations of AOM. Acute myringitis can occur in cases of posttraumatic acute otitis externa. Myringitis can be the consequence of bacterial acute otitis externa. Myringitis can also be the consequence of viral acute otitis externa. Fungal myringitis can occur in cases of fungal otitis externa. Eczematous myringitis can occur in cases of dermal eczema of the external acoustic canal. Acute myringitis can occur in cases of an exacerbation of chronic inflammation of the EAC. See also Middle Ear, Acute Otitis Media, Surgical Treatment and Middle Ear, Acute Otitis Media, Medical Treatment. In untreated patients, as middle ear pressure increases, the TM eventually perforates, pain decreases, and mucopurulent discharge with blood appears in the EAC. In cases of favorable cessation of AOM, the inflammatory process and all the inflammatory phenomena gradually regress with restoration of the TM and normal hearing. Similar phenomena occur in cases of viral myringitis (influenza). With viral myringitis, as with acute bullous myringitis, bubbles filled with blood form on the surface of the TM and burst with effusing blood; however, the TM is not perforated. In cases of adverse courses of the inflammatory process, perforation of the TM persists. Persisting perforation is one characteristic sign of chronic otitis media (COM). Chronic inflammation of the TM accompanies inflammation of the middle ear. On the surface of the TM, the epidermis is actively displaced into the ear canal, and, in 15% of cases, it may penetrate through small perforations of the TM. As a result, the middle ear is isolated, with resulting long-term hearing impairment. This takes place in cases in which the speed of mucosal displacement and that of epidermal displacement coincide. If perforation of the TM is considerable, the epidermis and the mucous membrane meet on the edge of the perforation. If the speed of the epidermis displacement and that of the mucosal displacement are different, conflict, which is typical for chronic myringitis, develops. When the redundant mucous membrane penetrates the perforation and extends over the edges of the dermis, growth of the epithelium ceases. The maceration of the dermis and its tendency to grow into the injured tissue become the main sources of inflammation. Lacking the necessary support, the mucous membrane forms granulation tissue and polyps. When redundant tissue has formed within the middle ear mucosa, the epidermis penetrates into the middle ear space through the edge of the perforated TM and expands there; it is exposed to desquamation, and cholesteatoma is formed. All types of dermatitis of the external ear affect the TM, involving it in similar inflammation. Chronic myringitis is often accompanied by chronic bacterial inflammation of the EAC. Chronic myringitis can also be the consequence of viral chronic otitis externa. Chronic fungal myringitis can occur in cases of chronic fungal otitis externa. Chronic eczematous myringitis can occur in cases of chronic dermal eczema of the external acoustic canal. Approximately 8% of children age 6 months to 12 years with AOM have acute bullous myringitis. Morbidity from myringitis is correlated with morbidity in cases of otitis media, external otitis, and foreign bodies in the ear. Data on racial distributions of TM diseases have not been collected. See also Middle Ear, Otitis Media with Effusion. Males and females are affected by diseases of the TM with equal frequency. People of all ages are affected. Elzir L, Saliba I. Bullous hemorrhagic myringitis. Otolaryngol Head Neck Surg. 2013 Feb. 148 (2):347-8. [Medline]. Crapko M, Kerschner JE, Syring M, Johnston N. Role of extra-esophageal reflux in chronic otitis media with effusion. Laryngoscope. 2007 Aug. 117(8):1419-23. [Medline]. Van Dyke MK, Pircon JY, Cohen R, et al. Etiology of Acute Otitis Media in Children Less Than 5 Years of Age: A Pooled Analysis of 10 Similarly Designed Observational Studies. Pediatr Infect Dis J. 2017 Mar. 36 (3):274-81. [Medline]. [Full Text]. Crowson MG, Callahan K, Saunders JE. Review of otorrhea microbiology: is there a pathogenic role of corynebacter?. Otol Neurotol. 2015 Feb. 36(2):244-9. [Medline]. Rezes S, Késmárki K, Sipka S, Sziklai I. Characterization of otitis media with effusion based on the ratio of albumin and immunoglobulin G concentrations in the effusion. Otol Neurotol. 2007 Aug. 28(5):663-7. [Medline]. Barclay L. Postop Tympanostomy Tube Obstruction Common. Medscape Medical News. Jul 11 2014. [Full Text]. Conrad DE, Levi JR, Theroux ZA, et al. Risk Factors Associated With Postoperative Tympanostomy Tube Obstruction. JAMA Otolaryngol Head Neck Surg. 2014 Jul 10. [Medline]. Chung J, Lee DY, Kim YH. Management of myringitis: Current concepts and review. Laryngoscope. 2018 Sep. 128 (9):2157-62. [Medline]. Phillips JS, Yung MW, Nunney I. Myringoplasty outcomes in the UK. J Laryngol Otol. 2015 Sep. 129 (9):860-4. [Medline]. Disclosure: Received royalty from American biloogical group for other.